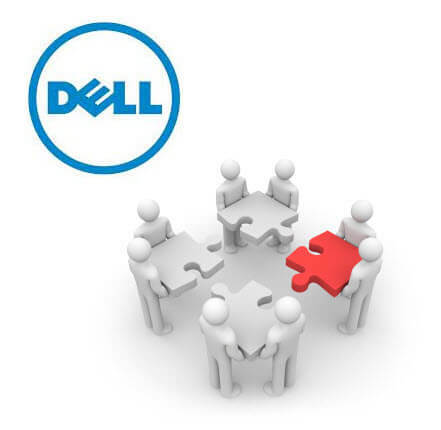 The Dell Leveraged Buyout, Part 4: Post-Buyout Add-On Acquisitions – A Value-Adding Pipe Dream? In theory, an add-on acquisition following a buyout is a nice plan. Raise additional funds, buy a fast-growing company, and exit at a higher multiple, right? The only problem is that it rarely works as intended. Part 4 of this Dell case study will show you not only why “add-on acquisitions” are often flawed, but also why you have to look very closely at the numbers from different sources before assuming anything. In Part 1, I explained where to find information and how to set up your Excel files for a deal like this. We also looked at some of the more unusual features of the deal, like the repatriated cash from overseas subsidiaries and the huge ownership change. Then in Part 2, we covered the revenue and expense projections and how to set up multiple scenarios. Part 3 consisted of a crash course on the debt schedules and how to set up all the formulas properly (I’ve seen a lot of really, really bad formulas in these schedules before – please avoid). We are skipping over steps in the interest of time and not turning this into a 25-part series – though you know where to get the full case study when you want it. Let’s see… some more drama happened, with Michael Dell offering a special dividend and a slightly increased per share bid for the company. Carl Icahn and Southeastern Asset Management still hate him despite the sweetened offer. But it seems like momentum has shifted in Michael Dell’s favor in the past few months, so we may see a resolution to this saga in September/October assuming a vote actually happens. 8:44: Is the Company Lying? 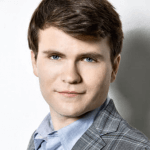 30:29: So, Do These Acquisitions Actually Help? The video above explains everything and shows you where all the numbers are coming from in Excel. We now have an area for the post-buyout add-on acquisition assumptions near the top, plus a spot to input the historical data on these deals. More annoyingly, we now have 6 extra columns in the model because we have to adjust the Balance Sheet for both acquisitions. You’re NOT going to have a fun time going through this file on a small laptop or tablet – you want as much screen space as possible. There’s really no way around these extra columns; besides just taking up extra space, they also make it more cumbersome to work with the model because now you need to “re-align” many formulas that reference the previous year’s numbers on the BS or CFS. If you’re brave, you can attempt to do this with Find and Replace. If you’re less brave, F2 (or Ctrl + U on the Mac) is your best friend. How to Find Information on These Potential Acquisitions: Is the Company Lying? The case study itself gives very minimal instructions on this – that is intentional, since they are testing your ability to gather information and make judgment calls on your own. Start by looking up acquisitions in the company’s most recent annual report (excerpt of the relevant section here) and also looking at their most recent investor presentations. In this case, they do indeed have useful information: we have summary stats from the investor presentation (see page 17), and then a full breakout of the financial results from the acquisitions over this past year on page 87 of the 10-K. So we can use this information to estimate the price of each add-on acquisition and what the Balance Sheet of each acquired company might look like. In short, the historical results from these acquisitions – which contributed a negative Net Income in the most recent fiscal year – seem much less impressive than what Dell claims to target in M&A deals. Southeastern Asset Management’s claims over the value of the acquired companies are also suspect (though not necessarily “wrong” – we would need to look at more data). The specific numbers we pick matter less than the ranges shown in sensitivity tables later on… so for now, we’re assuming $1.5 billion spent on Acquisition 1 and $2.0 billion spent on Acquisition 2 (in-line with some of Dell’s larger recent deals). We do a “mini-purchase price allocation” exercise for each one to get the basic items right, and then apply our findings above to estimate the yield, operating income, and revenue for each one (for more of an explanation of these concepts, see our how to calculate Goodwill tutorial). Based on past results, it’s highly unlikely that these will be high-margin / high-yielding deals. Yes, acquiring higher-growth businesses is great, but as is often the case in LBO scenarios, margins tend to matter more than growth. We’re assuming very similar profiles for both companies, but the second acquisition is 33% bigger; even the debt assumptions are fairly similar. Interest rates are higher than the initial interest rates on the LBO financing because the company will carry more debt by the time these deals take place. The 50/50 split between debt and equity here is questionable, because it’s unlikely that any PE firm would want to contribute that amount of equity to fund the deals. We’re going with it for now just so we can verify that the model is set up correctly and functions properly. I recommend starting on the Income Statement since it’s the easiest statement to modify. All you have to do is reflect the additional revenue from the acquired companies, the additional expenses, and the added amortization of intangibles from these deals…. And be careful to do all of this in the right places. Acquisition 2 takes place at the end of Year 4, so it only affects Year 5 in the model; Acquisition 1 only affects Years 3 – 5. You also have to be careful to reflect standalone vs. combined items in certain spots here. 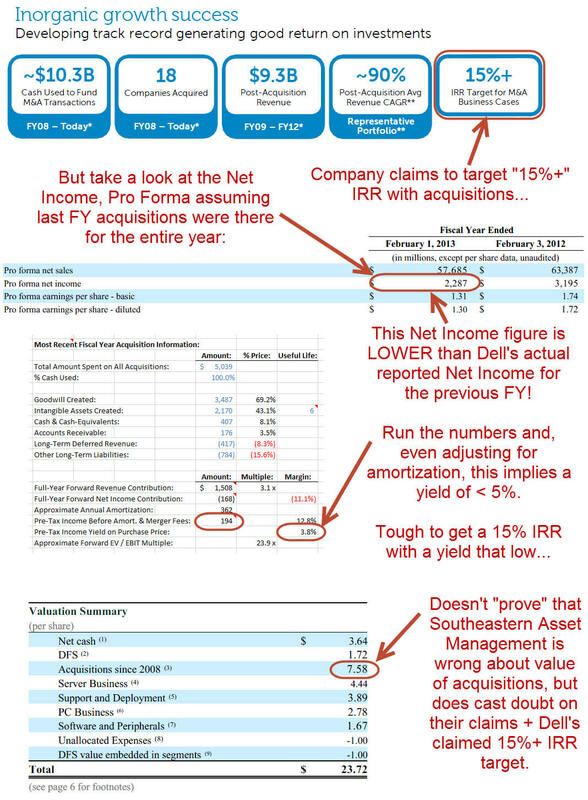 For example, we’re assuming that these acquired companies have no substantial COGS, only OpEx, so Gross Profit is really Dell’s standalone Gross Profit… but as you move down the Income Statement, Pre-Tax Income has to reflect the Pre-Tax Income from both Dell and the acquired companies. This is not conceptually difficult, but it’s easy to make careless mistakes. This is not too difficult since these add-on acquisitions are quite simple – we really only have Cash, AR, Goodwill, and Intangibles on the Assets side, and then Deferred Revenue, Other LT Liabilities, and Debt and Equity on the other side. This part gets very tricky/tedious because you have to “re-link” any formulas that reference the preceding column, if those formulas are in Year 2016 (right after Acquisition 1 closes) or Year 2018 (right after Acquisition 2 closes). So you need to shift any references to column N over to column Q, and any references to column S over to column V instead. This part is simple because it’s mostly just “re-linking” the working capital items (Changes in Operating Assets and Liabilities). The idea’s the same as above – change column N references to column Q, and column S to column V.
Other than that, you also have to remember to link in the new amortization of intangibles from the two acquisitions from the IS, and link in the mandatory and optional repayments for the acquisition-related debt at the bottom. Once again, this part is more about not screwing up as opposed to performing rocket science math. Before modifying these schedules, disable circular references in cell O16 at the top or you will get a lot of #REF! errors. Once that’s done, the setup is all in place already so it’s just a matter of copying down formulas and swapping in the correct column links. Make sure you also swap in the correct columns for everything in the “Sources of Funds” section (replace column N with column Q and column S with column V) – if you don’t, the cash numbers will be off. You’ll see that the acquisition debt gets paid off very quickly, at least in the Base Case, which implies that we could use more debt and less equity for both deals. 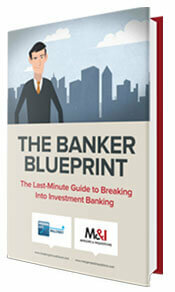 If the Balance Sheet doesn’t balance, your model is wrong. But even if it does balance, your model could still be wrong – for example, you might not be adhering to the minimum cash balance, a few links might not be updated, or it might balance by coincidence because multiple errors cancel each other out. Since there are so many columns and adjustments here, you probably want to move down the two post-add-on-acquisition columns (columns R and W) and press F2 (or Ctrl + U on the Mac) in each cell to verify that it’s linked correctly. Yes, it’s tedious, but that’s the nature of the beast. So, Do These Acquisitions Actually Help? 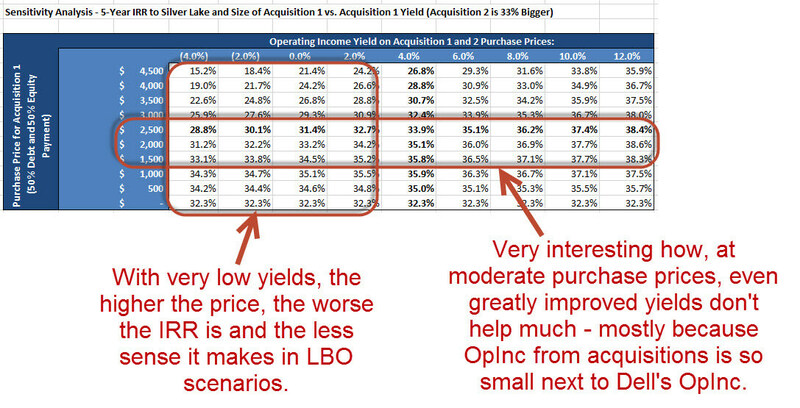 In short, the acquisitions make a relatively small difference regardless of the size and yield assumed. The main reason is that they’re just too small relative to Dell’s size (~$150 million of OpInc in the base case to Dell’s $3 billion) and the effective yields are too low. If the company could acquire a much bigger and/or higher-margin business, that might move the needle. But as it stands, it seems unlikely that these add-on acquisitions could change our opinion on the deal substantially. Yes, this part is rather difficult and it’s easy to make silly mistakes… but that’s the point of this practice exercise. If you can successfully complete this, you’ll be ahead of many entry-level bankers, many of whom have never even worked with a scenario like this. Oh yeah, and then subscribe to our YouTube channel to get news of new tutorial videos and clips as we add them. This almost takes us to the end of the case study. Up next, in Part 5, we’ll be going through a completely finished version of the model and showing you how to present this case study in a real interview. And you’ll get an actual case study presentation that you can just copy and paste and use in your own interviews. Very good article. Why are you saying that margins matter more than growth? I know it’s completely true as in buy and build you often do buy low growth companies but can’t wrap my head around this. Because the margins affect the returns far more than the growth rates if you look at the final sensitivities. Also, Dell’s margins had fluctuated quite a bit historically, so there was some debate about their future margins. But there weren’t as many questions about the company’s growth profile.